• Minimize or eliminate reflections in glass, water or most any surface except metal. The comparatively new “circular” polarizers were developed to minimize or eliminate metering issues. Most filter manufacturers list polarizers as having a variable filter factor, usually 2 to 4 depending on the effect of the polarization. I personally just use a factor of 2.5 (1.3 stop correction) because any further darkening, say, of a sky is an effect I want, and do not want to override. The great thing about using a polarizing filter is that you can actually see the effect before taking the picture. When held up to the eye or placed on a lens and rotated in a clockwise or counter-clockwise direction, you can see gradual lightening or darkening as you rotate. You can pick just the degree of effect you want. At its lightest orientation, it is essentially just a 1.3-stop neutral density filter. If you are using a non-through-the-lens camera (rangefinder, Holga, etc) you will need to hold the polarizing filter up to your eye and note what part of the filter is at “12 o’clock” for the effect you want, then put the filter on your lens in the same orientation. Above, a polarizer effectively eliminating reflections in glass. Note that the reflections in the polished table are only moderately affected – that light was polarized in a different direction. Below, note how the polarizer has darkened the sky, increased saturation in the colors and reduced haze. 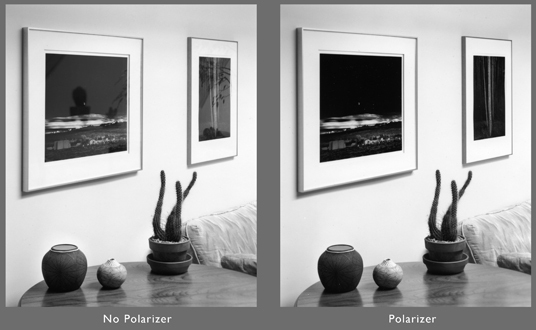 A polarizing filter works by darkening light in the subject that is already polarized. If there is no polarized light, the filter has no effect other than neutral density. The light in a sky is not evenly polarized, so if you are using a wide-angle lens you will capture part of the sky that may be highly polarized AND also include part of a sky that is less polarized. If you are using a wide-angle lens on a subject that does not include sky, you may not notice any odd effect. In the end, no well equipped camera case should be without the versatile polarizing filter! Do you dream of becoming a better photographer? with me at a really great price (shhh…don’t tell my CPA)!